Physicians preach to the power of diet and exercise. Now, we’ve already discussed the benefits of yoga. So we’re going to take a moment in this article to delve into the power of a healthy diet. Let’s jump into some of the best foods that you can pair with your workout to double your results. When you’re perusing the meat section at the grocery store, take a look at the fat content of your meats. Steer clear of fatty red meats (especially bacon, sausage, and ground beef). Stick to poultry and fish. These meats are low in fat and packed with nutrition. Fish oil is especially healthy. Opt for plenty of leafy greens. Also, try out quinoa, lentils, and beans. These little guys are big on protein. If you enjoy non-dairy milks, try out nut milks, soy milks, and the like. Nuts are always a good source of protein as well. When it comes to fat in your food, it pays to be picky. Opt for walnuts, avocados, canola oil, olives (and olive oil), nut butters, and flax seeds. 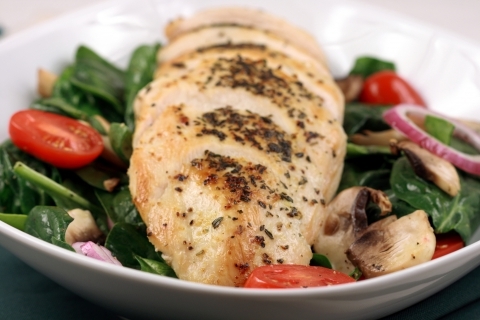 Protein, fat, and carbs fill out a balanced diet. When it comes to carbohydrates, you’ll want to opt for fruit, sweet potatoes, all types of legumes, whole grains, and potatoes. Just stay from the potato chips. Regardless of whether you’re just beginning your yoga journey, or you’re a hard-core yogi, changing your diet for the better can give your health and wellness a major boost. Stick to the aforementioned tasty, nutritious foods to get healthy!